"Metrics we collect during a simulated DDoS attack allow our customers to make data driven decisions on the best way to protect their organization"
DDoS testing is a simulation of a DDoS attack performed under controlled conditions with real traffic. The goal of DDoS testing is to answer specific questions about the target environment. DDoS attacks are unique for many organizations in that they are relatively infrequent, but when they do occur they're often catastrophic. This catastrophic nature requires that a strategy be implemented to protect the organization, but a lack of real-world experience may limit the effectiveness of any solution. The infrequency of DDoS attacks often means that IT teams are developing solutions based on the "last attack" and waiting until the "next attack" to determine success. 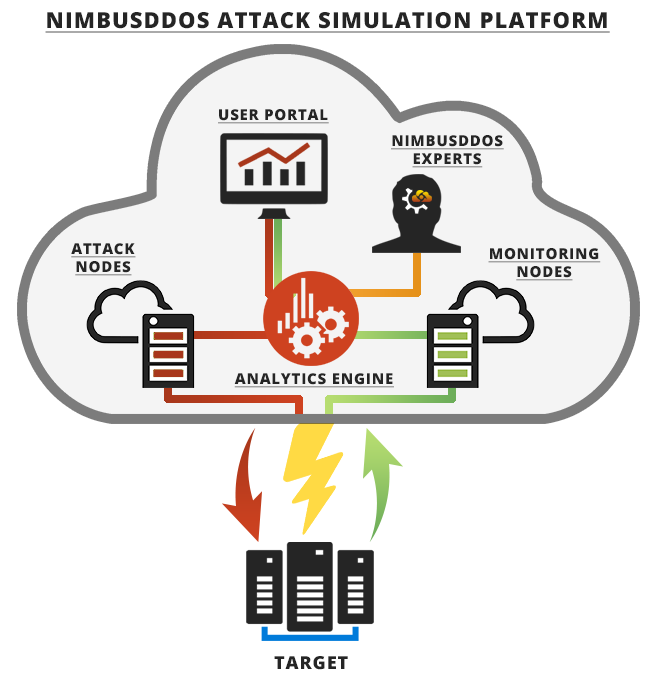 To address these challenges, NimbusDDOS created the first DDoS attack simulation platform. Our DDoS simulation services provide organizations the ability to proactively perform DDoS attack tests, using the same techniques used by real attackers. Unlike a real attack, a DDoS test is performed in a controlled manner and structured in a way to achieve the customer's objectives. // Assess Environment Impact: A DDoS attack test is highly effective at identifying bottlenecks and limitations within an environment. By proactively identifying these limitations, the capabilities of the environment can be extended, or additional defenses can be enabled in identified risk areas. // Assess Mitigation Strategy: Vendor mitigation solutions are often expensive, and are generally not a "silver bullet" to all threats. A DDoS simulation can help to proactively identify limitations or configuration errors in these solutions, prior to the next real DDoS attack. // Multi-Layer Testing: The NimbusDDOS attack simulation platform supports all known DDoS attacks. This breadth in available attack vectors allows the platform to be used to launch DDoS attacks specific to certain areas of the environment. For example a volumetric attack may overwhelm the Internet circuit at the network edge, and a layer-7 attack may penetrate deep within the network overwhelming a database or application server. // Consistent Starting Point: Within the NimbusDDOS product suite, the DDoS testing forms the foundation on which future changes can be measured against. The DDoS attack tests create a consistent baseline and future changes to the environment or mitigation strategies can easily be compared against that baseline, with the goal of ongoing improvement. // Data-Driven Decision Making: The NimbusDDOS attack simulation platform collects performance data throughout the DDoS tests. This data allows the environment impact and the effects of mitigation to be quantified, leading to improvements based upon actionable data. // Proactive: DDoS simulations are a proactive approach to managing DDoS risk. By leveraging the NimbusDDOS proprietary tools, organizations break the attacker-victim cycle putting them ahead of attackers. // Dedicated DDoS Expert: Each customer is assigned a dedicated DDoS expert that provides DDoS preparedness advice and guidance tailored to the customer's business.